The CAPM is essentially a single-factor model in that the security’s expected return depends on a single factor, namely, beta. But there may be other factors. apart from beta, which may affect required returns. 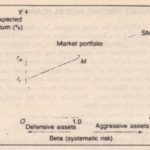 Therefore, the inclusion of these factors in the CAPM equation would provide better explanation of the variables impacting security returns. The major factors are: (i) taxes. (ii) inflation, (iii) liquidity, (iv) market capitalization size: and (v) price-earnings and market-to-book value ratios. These factors (showing extensions to the CAPM) are briefly explained in this Section.